Many people have misconceptions about Chinese herbs. You may equate them with the bottles of gingko tablets for better memory or ginger capsules for an upset stomach found on your grocery store shelf. The reality however, is that Chinese herbal medicine is far more complicated and nuanced than that. 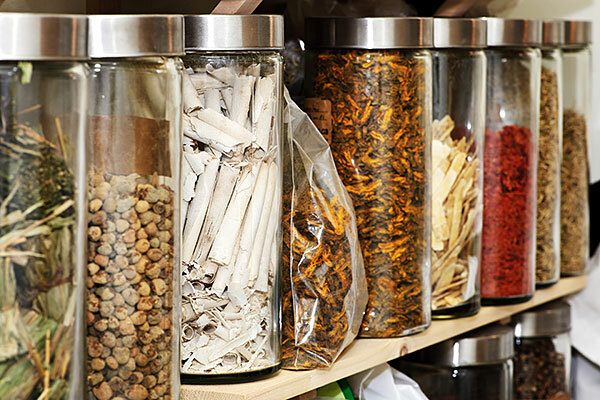 In order to become more acquainted with Chinese herbal medicine, here are some things to know. Chinese herbs are almost always combined into formulas, or groups of herbs, for the best results. That’s because your health is complicated, and rarely does a single herb do everything. Herbs are combined to strengthen a formula, balance the effects of other herbs, or address a specific symptom. Herbs are prescribed based on a pattern, not a specific symptom. For example, if you are struggling with insomnia, your practitioner needs to know what’s behind your sleeplessness before they can suggest an effective formula. Are you stressed and struggling to fall asleep because your mind is racing? Are hot flashes waking you up at night? Do you fall asleep but wake up at 3 a.m. every night and can’t get back to sleep? Do you get up to pee at night? Are vivid dreams waking you? Each of these instances call for a different combination of herbs. Chinese herbal formulas come in many forms. They may be taken as a tea, pills, capsules, tablets, or as a topical preparation. Each form has its own pros and cons. For example, an herbal tea, boiled from raw herbs, may be very effective but takes time to prepare and may taste so bad that you can’t get it down. In contrast, a formula made into a pill may be easy to take, but may take longer to achieve the same results as the herbal tea. Chinese herbs can be strong and very effective. Many people have the misconception that because they’re natural, herbs aren’t very strong. However nothing could be further from the truth. Many prescription drugs on the market today were developed from herbs. In most cases, your Chinese medicine practitioner will prescribe an herbal formula for you only for a week or two before assessing its effects. Chinese herbs aren’t always made out of plants. Mostly they are, but some herbs are actually minerals, such as gypsum, calcium, and iron. In addition, some herbs are derived from animals, such as insects, the fur from deer antlers, and gelatin made from the hooves of horses or donkeys. Throughout history, some herbs have been harvested from animals that are now endangered species. Fortunately, there are substitutions for many of those herbs that are also effective without harming endangered animals. Chinese herbs are usually compatible with prescription medications, but in some cases they’re not. For example, while St. John’s Wort isn’t necessarily a Chinese herb, it’s notorious for interacting with a number of prescription medications. If you’re taking the blood thinner Coumadin, herbs of any kind may be contraindicated because the Vitamin K they contain can alter the effectiveness of the drug. If you’re taking one or more prescription medications, be sure your practitioner is aware of what you’re taking and ask about any herb-drug interactions. Herbal medicine is an important healing tool that is part of Chinese medicine. Herbal formulas are safe when prescribed by a practitioner who is educated and experienced in their use, and they can be far more effective than buying a bottle of a single herb at the grocery store. In this article, Dr. Jeda covers the 6 important points about Chinese herbal medicine that most people don't know about.